The final book I’ll review this summer about the Philippines is the second anthology of stories for young people called Growing up Filipino. The stories have been collected and edited by award-winning author, Cecilia Manguerra Brainard, who grew up in the Philippines. The father of her death prompted her to first start to write. Besides being the author of nine books, Brainard has also edited four books, co-edited six books, and written a novel with four other women. In addition, Brainard has won many awards including a Special Recognition Award from the Los Angeles Board of Education for her work dealing with Asian American Youth. 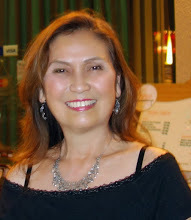 The Filipino and Filipino American communities whom she has served has also honored her work. From them, she has received the prestigious Filipinas Magazine Arts Award, and the Outstanding Individual Award from her birth city, Cebu, Philippines. A lecturer and a teacher of creative writing, Brainard is married and lives with her family in California. She kindly obliged me with the below interview. Please check back tomorrow too for my review of Growing Up Filipino II. ALLISON: How does life in the Philippines differ from that in the United States? CECILIA: There are many differences between the Philippines and the US, and I’ll talk about a few. The weather is different; the Philippines is tropical, while most of the US is temperate. What that means is that it’s generally warmer and more humid in the Philippines. There are only two seasons in the Philippines, wet and dry. Religion is also different. I believe around 80% of the people are Roman Catholic, and what this means is that the lives of Filipinos are dominated by religious rituals all year round. Religion is very important; in some department stores, everybody stops to say the Angelus at six in the evening. Many shopping malls will have a chapel to allow people to go to Mass right there. The food is also different. Generally Filipinos eat rice, fish, pork, chicken, vegetables. Eating is an important part of people’s lives, at home and during celebrations. Almost always, when you visit a Filipino home, you will be offered something to eat and drink. Family life is also different. Filipinos are very family oriented and they have extended families. A household may include three-generations, the grandparents, parents, and children. Filipinos generally respect and treat their elderly well. Likewise, the older people value children and go out of their way to spend a lot of time with their children. ALLISON: What do you most miss about the Philippines? CECILIA: Perhaps what I miss are the opportunities to attend graduations, weddings, baptisms, and other rituals relating to my family and friends there. I have my own nuclear family here in the US so I am not alone, and the internet allows me to connect with my family there and old friends, but it’s different to be physically present for these milestones. I’ve missed many of these important events in my family and friends’ lives because of the distance separating us. ALLISON: What do you most appreciate about the United States? CECILIA: The US is a very generous country and provides many opportunities to immigrants like myself. I came to this country as a graduate student and as it turned out I married a Peace Corps Volunteer whom I had met in the Philippines. Aside from having a family, I have been given the opportunities to be a writer, editor, and teacher. I have seen many other immigrants who have come to this country with very little and after a few years, managed to provide their families with nice homes and educational opportunities for their children. If one is willing to work in this country, one can get ahead, because the opportunities are there. In the Philippines and in other countries, in many ways, the social structures are rigid, meaning people have a difficult time moving up to another social stratum. ALLISON: You live in California but are considered the voice of your generation in Filipino literature. Does this geographical distance pose any challenges for you in this role? CECILIA: Even while I live in California, I visit the Philippines regularly, so I feel I have a bi-cultural background. I know and understand both Filipino and American cultures, but at the same time, I feel I can step back to have an objective perspective about either culture. In other words, I can be an observer if I choose to be, which puts me in an interesting situation. In many ways, I have a broader perspective and wider subject matter because of this bi-cultural experience. ALLISON: What inspired you to compile the two anthologies about growing up in the Philippines? CECILIA: I learned from my Philippine publisher that there was a lack of books for young adults, and so I decided to edit Growing Up Filipino: Stories for Young Adults. I followed this up with Growing Up Filipino II: More Stories for Young Adults. Both books have received excellent reviews and have been and continue to be used in many classrooms in the US and in the Philippines. ALLISON: On your blog, you often recommend Filipino writers of adult literature. What writers would you recommend to young people? CECILIA: I admire the writings of Brian Roley, Linda Ty-Casper, Lina Espina-Moore, Paulino Lim, Jr., F. Sionil Jose, among many others. ALLISON: If my readers were to have the opportunity to visit the Philippines, what places should form the highlights of their trip? CECILIA: One would have to visit the City of Manila, which is sprawling and has many sections. Manila has the Intramuros or old Spanish Colonial section; it is near the modern city of Makati with high rises; it is also near Corregidor Island, which is an important World War II historic site. From Manila, one can take a day trip to Tagaytay, which has Taal Lake. Further north of Manila, is the Spanish Colonial City of Vigan, which I find very charming, although this is a long drive from Manila. The place of Banaue, which is in Northern Philippines, has the world-famous rice terraces. There are mountains with rice terraces carved along the sides; it had taken centuries for the people to create those rice terraces. This place is considered one of the wonders of the world. Many people like to visit the Southern Philippines: Cebu, where I was born, and Bohol, both of which have very nice beaches. Palawan is also a beautiful place with pristine beaches. I have heard Batanes is beautiful but have not had the chance to go there. Divers from all over the world visit the Philippines for the fine scuba diving there. Others visit the Philippines during the time of festivals like the Sinulog in January held in my birthplace of Cebu. There are many other interesting places in the Philippines, which has over 7,000 islands. I hope one day you will have the chance to visit. Thanks Allison for this interview.